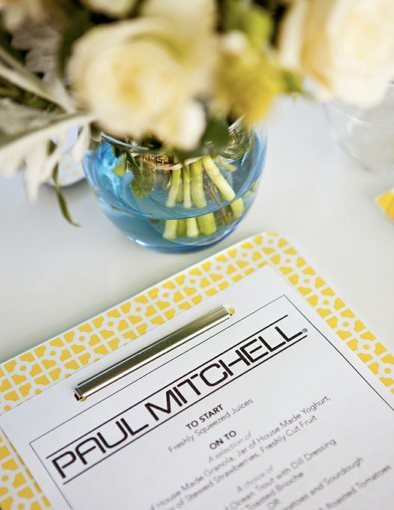 Last Wednesday the Portobello PR team held a morning breakfast at the Sailors Club, to launch Paul Mitchell's Forever Blonde System. A new four-step sulphate-free way for women to make the most of their decision to 'live light'. Landing in Australia right in time for summer, Forever Blonde boasts KerActive - an advanced development in activated keratin exclusive to Paul Mitchell which enables special keratin molecules to 'hug' the hair tightly for unparalleled condition. The system also promised not to turn hair dull with heavy 'purple' tones- in fact any blonde can use this system daily! Paul Mitchell's Forever Blonde System is designed to care for all blondes- from subtle highlighted looks to the quintessential platinum guest. KerActive protein helps to repair and seal the cuticle while safflower oleospmes (nature's most powerful lipid delivery system) replenish lost moisture and nutrients. Special botanicals are added across the four step system to lighten, brighten and maintain the most beautiful blondes.